Xcel plans to add 12 wind farms in seven states, leading to more than 11 GW on its system by 2021. Xcel is working with Google to develop new ways for customers to access account information and personalize energy management. 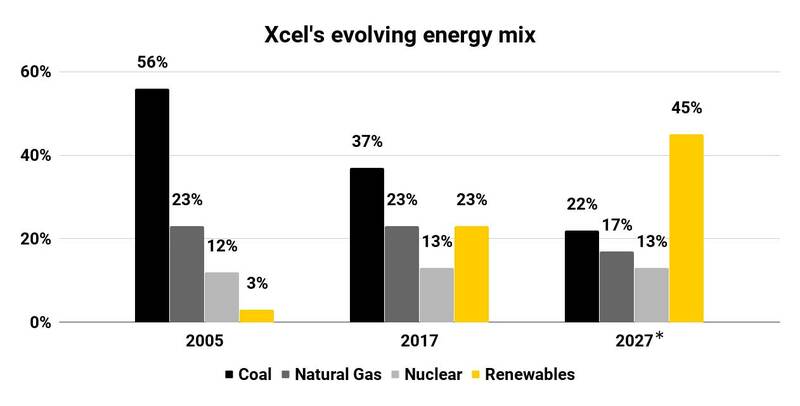 Xcel will retire 50% of its coal-powered capacity from 2005 to 2026, replacing it with a combination of renewables, energy efficiency and natural gas. Xcel Energy is a leader in the U.S. power sector's transition to a clean energy future, making significant investments in renewable energy and electric vehicles while pursuing innovative business models. As 2017 came to a close, the energy world was abuzz over record low solar+storage and wind+storage prices emerging from an all-source solicitation by Xcel Energy in Colorado. And the company’s momentum on a range of grid modernization issues across its service territories has persisted in 2018. The solicitation is part of the company’s $2.5 billion plan to procure up to 1,100 MW of wind and 700 MW of large-scale solar in Colorado as it retires 660 MW of coal-fired capacity a decade earlier than scheduled. The plan also calls for 275 MW of large-scale storage to be paired with solar, and using 380 MW of "existing flexible gas resources." "We believe the [Colorado] plan is a model for a successful clean energy transition. It will provide over $200 million worth of savings for customers compared to the alternatives, while reducing carbon emissions nearly 60% and increasing renewable energy sources to 55% of our energy mix by 2026 in the state," Xcel said. The company's overall goal is to reduce carbon emissions 60% by 2030 from 2005 levels. Colorado regulators approved the plan in August, which has drawn praise from environmentalists. Zach Pierce, senior campaign representative for Sierra Club's Beyond Coal Campaign, called it a "pretty bold and exciting example of a major utility embracing the drop of renewable energy prices in the region." But the plan "is just the beginning in terms of our ability to reduce costs and secure improvements in air and water quality associated with the shift to clean energy," he told Utility Dive. Xcel's Minnesota subsidiary, Northern States Power, is taking significant clean energy and grid modernization steps as well. The company's 300 MW Dakota Range wind energy project was approved by the Minnesota Public Utility Commission earlier this year. Minnesota regulators in June also approved Xcel's residential time-of-use (TOU) pilot, which is expected to launch in 2020 and has garnered praise from a range of stakeholders. Northern States Power also filed a $25 million plan with the Minnesota PUC in October to support broader use of electric vehicles. The plans include a fast charging corridor pilot; a monthly subscription that offers a set bill for charging and equipment, along with incentives to charge overnight; and a charging network. Xcel is working with the Colorado Public Utilities Commission on future EV initiatives and the utility role, and expects to submit related filings in 2019. "Over time, we’ll deploy innovative EV services to more of our customers," Xcel told Utility Dive. Elsewhere in Xcel’s 8-state operating portfolio, Texas and New Mexico regulators earlier this year approved the company’s $1.6 billion, 1.2 GW wind expansion plan. The 478 MW Hale project near Plainview, Texas and 522 MW Sagamore facility near Portales, New Mexico, are expected online in 2019 and 2020, respectively. *2027 figures are based on an estimate. These figures are based on a slideshow from a company presentation for investors on quarterly results. The renewable investments are part of what Xcel calls its “steel for fuel” strategy, shifting from fossil fuel generation to renewables. Last year, CEO Ben Fowke told Utility Dive the move has been made possible by steeply declining prices for wind, solar and battery technologies. "We’re seeing unprecedented low pricing across a range of generation technologies, including wind at levelized pricing between $11-18/MWh and solar with storage between $30-$32/MWh," Xcel told Utility Dive in November of this year. By 2021, Xcel expects wind will be its single biggest resource in terms of generation output. While the company is on track to double its wind capacity in the 2020s, the company will “probably be more oriented towards solar as, again, we start to need the capacity to replace retiring coal plants,” Fowke told analysts during the company's Q2 2018 earnings call. Xcel told Utility Dive in November it expects to double solar generation by 2022. Xcel is "starting to develop more customized programs to allow customers to have EVs and other customized products. I think it's going to open up a whole new world for us," Fowke said Oct. 25 during the company's Q3 earnings call. "...[W]e are behind probably some of our peers in some of our grid monetization efforts. And so, I think we've got a great transparent opportunity to have investments going forward," he added.